A license plate from one of the vintage cars my brother is working on. This 1966 plate hails from Holt County, Nebraska. In the lower left corner it bears the Nebraska Centennial sticker, 1867-1967. The plates in 1966 were white with red letters. This one is so aged, the white isn't even visible anymore. 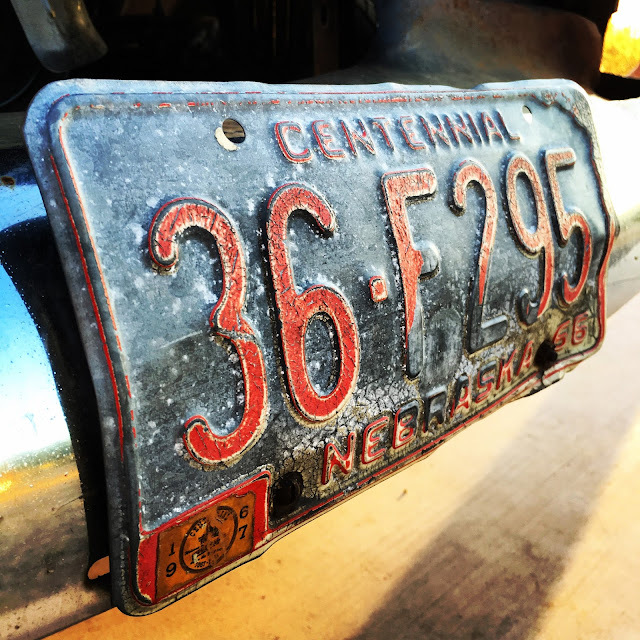 We know the plate is from Holt County because in the Nebraska license plate system, Holt County was represented by the prefix 36 because it had the thirty-sixth-largest number of vehicles register in the county when the license plate system was established in 1922. In Nebraska, motor vehicles were first registered in 1905. The residents made their own license plates and registrations were recorded with the Secretary of State. The original plates were made of leather with metal numbers.